Create a living room, family room or den where you can comfortably sit back and relax with this double power reclining sofa. This sofa features padded arms and chaise seats while the back is tufted for a hint of style. The Corsica Powerized Double Reclining Sofa with Pillow Arms and Tufted Back by Lane at AHFA in the area. Product availability may vary. Contact us for the most current availability on this product. Leg or Skirt Hidden reclining base. Casual and comfortable this reclining collection can update your living room, family room or anywhere in your home you want to add reclining seating. Completely transform a large space with a sectional or add in a loveseat with console for concealed storage. 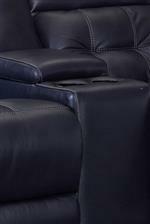 This motion collection features padded chaise footrests for head to toe comfort and simple tufting on the seat backs. 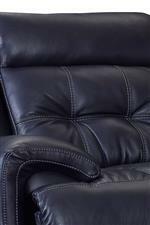 The Corsica collection is a great option if you are looking for Casual furniture in the area. Browse other items in the Corsica collection from AHFA in the area.